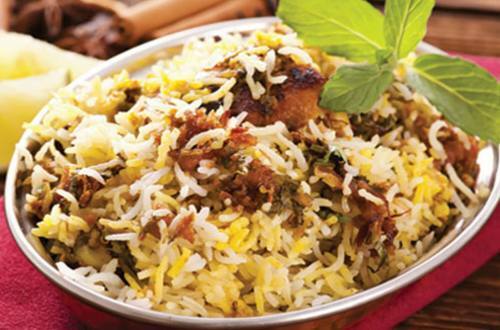 Light and aromatic, this delicate vegetable Hyderabadi biryani is easy to make with Knorrs convenient mix that has all the flavour of the ingredients that create an authentic Hyderabadi Biryani. 2 Then, add 1-2 chopped tomatoes, ½ tbsp Ginger-Garlic Paste, 1 tsp Coriander powder, ½ tsp Red Chilli Powder, a pinch of turmeric powder and 1¼ tsp salt and cook on slow flame till oil separates. 3 Add the vegetables into the onion tomato masala along with about 1 cup(150 ml) water and 2 tbsp(16g) of Knorr Chef’s Biryani Masala, cover with a lid and cook on slow flame for 20 minutes or till the vegetables are done. 4 Close the flame and sprinkle 3-4 mint leaves on top of the cooked vegetables. 5 In a separate large pan, boil the rice in about 750 ml water along with 2 tbsp oil and 1 tbsp lemon juice. Cook the rice till it is nearly done (not fully done), drain the excess water and spread the rice over the cooked vegetables. 6 Cover the pan with a heavy lid and cook on dum (slow flame) for 5-10 minutes till the steam comes out. Serve Hot! You just can’t have enough of this favourite dish of royalty, whose fragrance and delicate flavours will take you back to memories of your favourite restaurant!